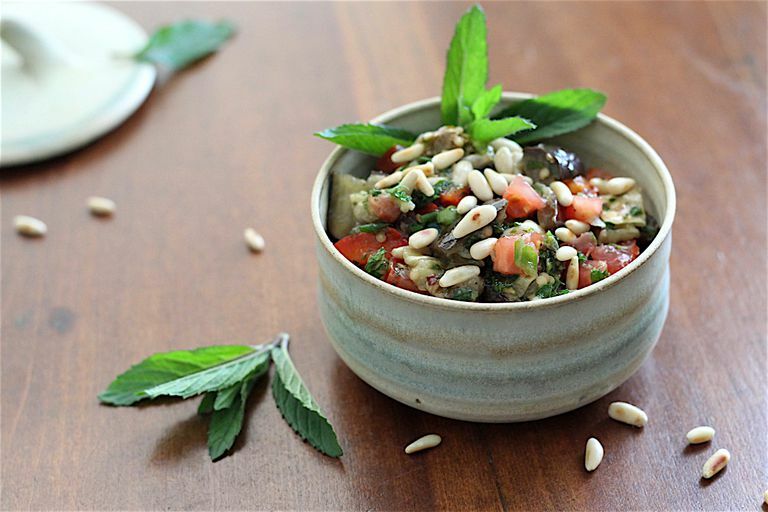 Every Mediterranean country seems to have its own version of a marinated eggplant salad. No wonder. It is a versatile and tasty dish that can be served as an appetizer or a side dish. Our low-FODMAP version owes its delicious flavor to toasting the pine nuts, roasting the vegetables, and using fresh lemon juice and herbs in the dressing. In a small heavy skillet, toast pine nuts over medium heat, stirring constantly for about 5 minutes or until they become shiny and turn golden brown in spots. Supervise them closely, as nuts burn easily. Halve and seed the red peppers. Cut the eggplant lengthwise into 1-inch slabs. Grill the vegetables over medium heat on a propane or charcoal grill until tender, about 15 minutes. When they are cool enough to handle, coarsely chop the grilled vegetables and transfer them to a medium serving bowl. Add the tomato, scallion greens, olive oil, lemon juice, parsley, mint, salt, black pepper, red pepper flakes, and smoked paprika. Toss lightly to combine ingredients and serve warm or cold. The eggplant and bell pepper can also be oven-roasted. Arrange them on a foil-lined baking sheet and bake at 425F for 30 minutes, until vegetables are soft and beginning to brown in places. Add pine nuts immediately before serving.